In contrast to mobile animals, which can seek environments suitable for survival, immobile plants must use their flexible and efficient environmental response systems in order to respond rapidly to a variety of environmental changes. However, it remains unclear how plants control, assess, remember, and transmit information from the environment without brains or nerves. This area of study seeks answers to profound and longstanding biological questions. 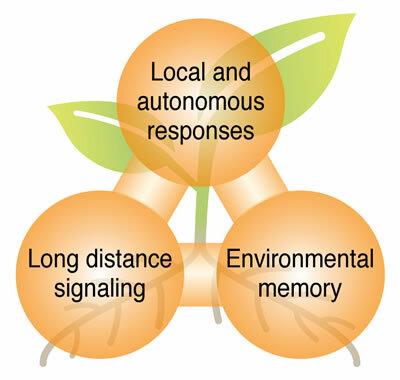 Plants have evolved an autonomous, distributed environmental response control system that controls incoming signals via a systemic information transmission system, while carrying out autonomous environmental responses by distributing control to groups of cells and tissues. Our objective is to understand the mechanisms of plastic growth in response to the environment that are unique to plants. To this end, we seek to elucidate the long-distance signal transduction system ? which is completely different from those of animals ? that constitutes the local and autonomous environmental response system. Additionally, elucidation of the environmental memory system, which involves spatiotemporal caching of information via chromatin modifications, will be important for understanding plastic growth.